As I mentioned in my earlier post about potato leek soup, I’ve been ill since the beginning of the new year and I haven’t done a lot of cooking as a result. I’m just starting to feel like I’m on the mend, so I was able to stand in the kitchen for a little longer today than yesterday to make something with a little more substance than soup. Don’t get me wrong: soup is great and very comforting, but sometimes you want something with a bit more chew. Pasta is something I don’t have on a regular basis but I usually have some boxes of whole wheat noodles or pasta in the pantry at all times, just in case. Considering I’m low on proteins in the fridge right now, I had to work with what I had. There is some ground chicken and some pork schnitzels in the freezer, but both need thawing before they can be used. What protein do I have in abundance in the fridge? Low-sodium turkey bacon! Yum! In a wok or large skillet, heat butter and extra virgin olive oil over a medium heat. Cook the turkey bacon for a minute or two, allowing it to start to crisp up. Add the leeks and seasonings, then stir to mix. Cook until the leeks wilt down (a few minutes). Pour in the Alfredo sauce and stir to mix. Heat through for a few minutes. The sauce will start to change colour as the seasonings mix and cook into it. Stir in the Parmesan cheese and milk and cook a little while longer until the mixture is bubbling all over. Remember to stir a few times to prevent it from sticking to the bottom of the pan. In a large ceramic or glass serving dish, pour in the cooked pasta, then the sauce over the top of the pasta. Mix thoroughly in the bowl and serve topped with a little bit of grated mozzarella or Monterrey Jack cheese and some chopped or dried parsley. It’s a little bit higher in the carbs than I’d prefer but next time, I might cook up another meat (like baked chicken) and serve this in a smaller, half-sized side-dish portion for half the values (176 calories, 23.5g carbs, 6.5g fat, 6.5g protein, 282.5mg sodium, 1.5g sugar). 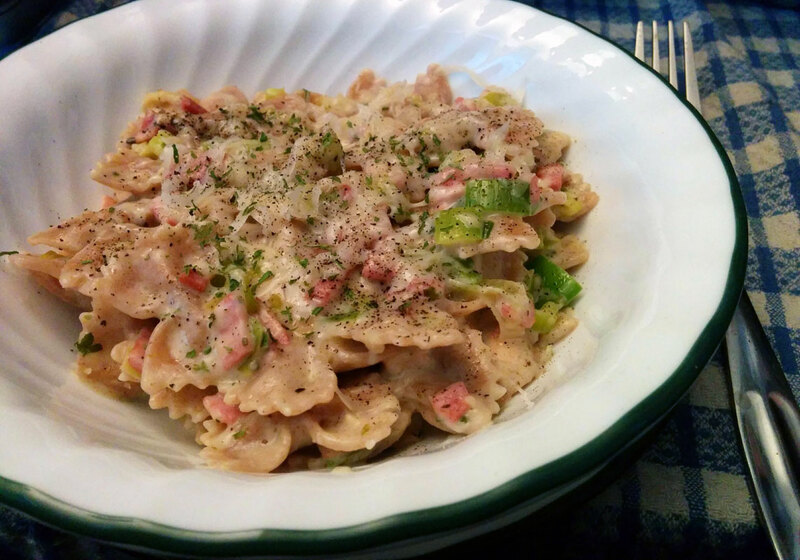 This entry was posted in comfort food, dinner, Lunch, nutritional values, one-pot-wonders, quick meals, quick-and-easy, recipe, sides, stove-top and tagged alfredo sauce, basil, black pepper, extra virgin olive oil, garlic, leeks, light Parmesan, light parmesan cheese, low sodium turkey bacon, Mrs Dash, mrs. dash table blend, olive oil, oregano, parmesan cheese, pasta, reduced sodium turkey bacon, salt, skim milk, thyme, turkey bacon, unsalted butter, unsalted margarine. Bookmark the permalink. I just stumbled across your blog right now and I’m so happy I did. I really appreciate how you cook from a realistic point of view. I can come home and whip up food and not have to worry about special gourmet techniques. I plan on making this tonight. YES! I’m always looking for tips like that which not only make life in the kitchen easier but are still really tasty.